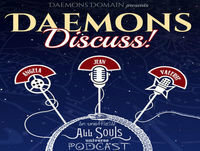 We are the Daemons - All Souls Trilogy (by Deborah Harkness) enthusiasts exploring the All Souls universe We discuss The All Souls Trilogy, and the subjects that orbit it! Looking forward, we plan to discuss to the upcoming Television series and 'The Serpent's Mirror,' due in 2017. We run the fan site www.DaemonsDomain.com. This is an unofficial fan podcast.